Some comments I made on the old RebreatherWorld Deep Stops Thread. Note: These comments reflect the thinking I had a couple of years ago. I have added a few references for people can look up articles I mention. In the near future I will post some comments on technical diving research that has come available since then, and how my personal practices have changed. I’ve been asked in private communication if I would use 40/70 for all of my technical diving. I thought it might be worthwhile for me to talk about my journey to my current thinking. Keep in mind that I am a programmer and avid decompression diver. I am not a decompression scientist. This is a personal, anecdotal, opinion. I began doing open-circuit nitrox and trimix decompression in the 90s. By the end of the 90s I had a few rebreathers and was doing a lot of decompression diving. I logged over 500 dives back then, but I haven’t kept logs for the last 15 years. The reason I mention my diving activity is for statistical reasons. I have done, and still do, a lot of technical diving. It is important to me whether my risk of decompression injury is 1/1,000 or 1/10,000. From the frequency of my DCS issues I would estimate that I was somewhere in the 1/500 range. I have had several minor DCS injuries over the years and I have probably had a slight skin rash on my stomach 10 or more times. I have been actively trying to back off the risk but it has been challenging due to the lack of hard data for our kind of diving. Scientists might refer to it as bounce decompression diving as opposed to saturation decompression diving. Deep Stops in Technical Diving: Yes or No? 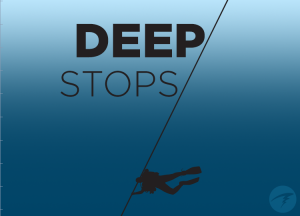 I read Dr. Richard Pyle’s speculations, The importance of deep safety stops: Rethinking ascent patterns from decompression dives. and they made a lot of sense. Deeper initial stops became quite common as a practice, and also started appearing in computers (VR3), tables, and desktop programs (VPM and GF). The early implementation of VPM was apparently too aggressive so it was modified with VPM-B and then VPM-B/E. At that point, I thought all of the solutions were about equally likely to be optimal. I watched presentations by Dr. Bruce Wienke, and later by Dr. Wayne Gerth on the value of deep stops. It all seemed reasonable and the proponents made strong statements in favor of deeper and longer stops. Then the Navy did their study. I was at the UHMS Deep Stops Workshop in Salt Lake City June 24-25, 2008 where the study was presented. It was a VERY controversial meeting. Dr. Wienke presented his case for deep stops and Dr. Gerth, who was also promoting deep stops with Dr. Wienke a year earlier, was presenting the Navy study. Dr. Gerth described the findings and how the results did not support deep stops, as he had expected. Then it got interesting. We go to a lot of these conferences, and when the microphones on the floor are opened for questions you might see a couple people line up to ask questions. When they opened for questions to discuss the findings of the conference, there were immediately 20 people at the microphone, and some of them clearly had strong feelings. Dr. Simon Mitchell was the moderator, tasked with finding a consensus after all of the presentations. Lynn and I had never met him before but were really impressed with how he handled the group. Regardless of the position of the speaker, Dr. Mitchell first clarified the position, typically by rephrasing it, and then offered suggestions about how it could be incorporated in the position statement. If at any time he was trying to influence the outcome of the discussion, it certainly didn’t seem like it to us. In the end the position statement was very weak, neither endorsing nor discarding deep stops. After this conference, I was still on the fence. I was happy with offering GF and VPM-B with GF surfacing with our products. The Navy study seemed compelling since it was actual dive testing, but there were so many scientists that weren’t convinced that it seemed to me the jury was still out. The next direction I took came from discussions with Dr. Neal Pollock. He and his team from DAN were doing bubble and blood studies with trimix divers. This DAN program is ongoing, and they continue to collect data. I observed it for several years at InnerSpace in Grand Cayman. These were aggressive testing regimens with retests every 20 minutes starting on the boat just after surfacing and then long enough afterwards to see a safe pattern. Many of these divers experimented with their conservatism during the test series. A couple of years ago, a group of divers started talking about adjustments they were making and the results. Phil Short and I were among the people at the table. The consensus seemed to be that everyone was padding their shallow stops to reduce bubble scores. I have been padding my shallow stops for a couple years now with something like 30/70 or 30/75 with good results. I began reading with an open mind. However, as Ross Hemingway kept coming up with challenges and people then came back with strong analysis, my views changed. As far as I can tell, Ross offered every possible objection about shape, gas transfers, and red herring effects. In each case this prompted another level of analysis that changed another question in my mind to a confident belief. The level of analysis in this thread by Dr. Dollette and Kevin Watts was an education. The moderation, summation, and refocusing by Dr. Mitchell has created one of the most informative threads in the history of RBW in my opinion. After this I was using 40/70. The 70 drifted out to 75 or even 85 over time as I became more confident that the shallower first stop was making a difference. Would love to hear more on this subject ! Very many thanks for your personal and enlightening thoughts on this subject. The theory of deep stops fascinates me and is in my opinion very hard to tie down. Like you my GFs have drifted, often through opinion than proven fact. I am often asked my views and carefully (like you) point out that it is simply my opinion with no scientific back up. I will post folk to this thread on your site as it gives a good steer in the correct direction. Yes. While the evidence against the efficacy of deep stops is already compelling, the exact adjustments that should be made to my GF setting is less clear. I have been following the Extreme Diving Field Study as it has progressed, and have used my discussions with several of the participants to inform my current views. I am looking forward to more data from DAN’s Extreme Diving Field Study when it gets published. Less of a comment, more of a question. I run my Petrel as a stand alone backup to my AP Diving Inspiration CCR. I find that the 40/80 GF on the Petrel gives the almost the same runtimes as the Inspo handset set to 50/90 GF. The only difference being that the stops start deeper on the Petrel. Is there a simple explanation for this? There is no inherent reason why the two computers would not display the same stops with the same settings. The explanation is probably that the Inspiration computer is using the live PPO2 and the Petrel is using a preset PPO2. As long as they have the same PPO2 and the other settings are the same, they should give the same run-times. Tim Saville asked a question and I believe the answer Bruce offered is accurate, but I might also add that Vision electronics uses ZHL-16B and he might have his Shearwater set to a ZHL-16C. This could also bring about some differences. Yes, that would certainly make a difference. The M-Values are different. That would be an unusual choice though. 16C is recommended for computers. Bruce, I comment from a point of limited knowledge on the subject having only done a handful of deep ish dives with minimal deco. What I don’t understand is why ascent rates are arithmetic rather than geometric. Should your computer not have a deco algorithm with a logarithmic (or similar) ascent rate, decreasing as you ascend to your first (shallow?) stop. On a similar note, does your SAC rate not affect gas loading. The ascent rates that we use are defined by common practice as taught by the training agencies. On the other hand, one could certainly make a case for logarithmic ascent rates based on the relative changes in pressure at different points in the dive. For example, a 10 foot change in depth at 300 feet is a small relative change in pressure, whereas a 10 foot change in depth at 30 feet is a much bigger relative change in pressure. These issues are being discussed but I’m not aware of any evidence strong enough for us to change our calculations. For my own diving, I ascend faster when I am deeper and progressively slow down as I get shallower. I don’t have good evidence for this practice, but it makes sense to me. SAC rate does not affect the gas loading calculations in the Buhlmann/GF model. Nice article Bruce, I still think we have some work to do on active decompression and biometrics….the next decade should be fun! Appreciate the article Bruce, and I am looking forward to hearing more about your present thoughts. Also, I’d like to say that I think your product is excellent and your company’s customer service simply outstanding. That said, I was a bit confused about you changes in GFs after you read and discussed with the sources you listed. My understanding of the Navy study and much of the discussion on the RBW forum was that deep stops were not supported by the evidence–which you stated. However, if you accept this evidence, I would have expected that to result in you changing your GF Lo, as that controls the first stop. I realize you said you’ve gone from 30/70-ish to 40/75-85. But it would seem to me that if the efficacy of stops, according to the Navy study, is found in the shallower depths and the deeper stops resulted in greater on-gassing, you would have kept a conservative GF Hi and pushed your GF Lo up further to reduce deep stop on-gassing. I agree. As I have said, my views have changed since then, in particular with regard to shallow stops. There are still people today recommending 10/85 and 20/80 so it seemed like middle ground at the time. I will talk more about this in a future blog, but I am diving 30/70 or even 30/60 now depending on the dive. 40/70 is still a deep stop, but the 70 part is what makes the difference. It extends the ZHL Buhlmann shallow time by 30% to 60%, and its that large shallow time extension that makes the difference to microbubbles – nothing to do with deep stops at all. The navy test has no deep stops – instead they fiddled the stops between 60 and 30 ft, and try to imply its a deep stop, but simple math shows its not. They tried to make a fake compare to RGBM. Simon and co then stretched out VPM to make another fake compare, invented dimensions that do not exist, and tried to show these. A whole lot of fallacy going on here. Kevin Watts data is based of stretched out fake data, and the mb/min is a fabrication to make his point, but that risk actually works backwards and disproves his point. The RB thread sounds more like a marketing campaign, which is exactly what it is. If the best argument you have is that the Navy faked their tests and everyone else is faking their analysis of the data, you don’t have much to work with. The complete absence of data to confirm your position doesn’t help either. As to your link to a comment I made in 2001, yes, I said that. The difference is that I have changed my position in light of new evidence. Evidence is the way forward. The concept of the curve still interests me, but now I am thinking about it more regarding ascent rates. Should we be adjusting our ascent rates to be a curve rather than a strait line? DAN continues to research this topic and, although the research has not yet been published, I have been able to talk to many participants about their insights. My views and my diving habits have been informed by this information which is coming from actual evidence from real dives. My plan is/was to write a separate blog to describe my reasoning for moving to 30/70. What are you thoughts on the VPM-GFS algorithm then? Seems to offer a nicely conservative approach. It seems to me that data from NEDU and the French Navy (Blatteau) mean the definition of conservatism may need a complete rethink when it comes to ascent profiles. If the most current research seems to indicate that the disadvantages of being deeper longer outweigh the possible advantages of controlling bubble formation, then wouldn’t something closer to Buhlmann’s algorithm for the first stop (i.e., GF Lo) and something further away from the M-values upon surfacing (GF Hi) be the way to add conservatism? A 90/70 GF Lo/Hi perhaps? What do you suggest to prevent it? What was your run time? Is a 4/6 hous dive a bounce dive? Apologies if I’m being blind and conscious that this is an old post but I just wondered if you every did the “More to come soon …” please. Hi, Andy. There is no blindness. We are still working on it. There’s been more evidence coming out lately. Stay tuned. Cheers. I’m holding my breath for this new information! Deep stops lead to lost of discussions over here. In a recent publication the Pyle method was still mentioned as a good way to safer diving. It would be nice to have some more data.